We're here at NVIDIA's GPU Technology Conference in San Jose, and company CEO Jen Hsun-Huang has just revealed the next step in its GPU roadmap. Called Volta, it's scheduled to arrive after Maxwell, and will advance GPU technology with a ridiculous amount of memory bandwidth Volta GPUs will have access to up to 1TB per second of bandwidth by stacking the DRAM on top of the GPU itself, with a silica substrate between them. Then, by cutting a hole through the silicon and connecting each layer it's possible to move, according to Huang "all of the data from a full Blu-Ray disc through the chip in 1/50th of a second." We aren't exactly sure what that means for graphics, but being able to process data that quickly is bound to be a boon for gamers... whenever Volta actually arrives, of course. do we even have maxwell yet? 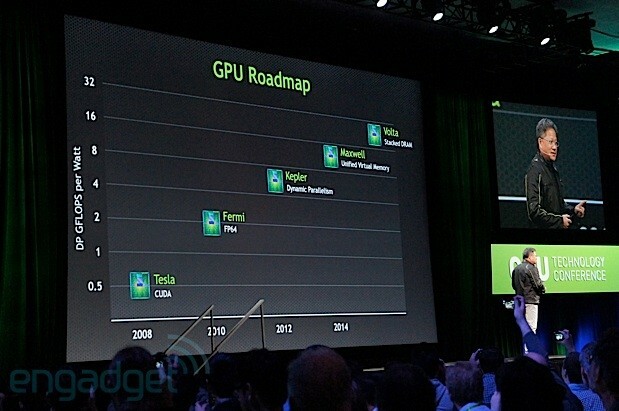 Judging by that roadmap in the image, Maxwell won't launch until next year, and Volta close to 2016. When it does launch, I bet there's an Asus Mars Volta.